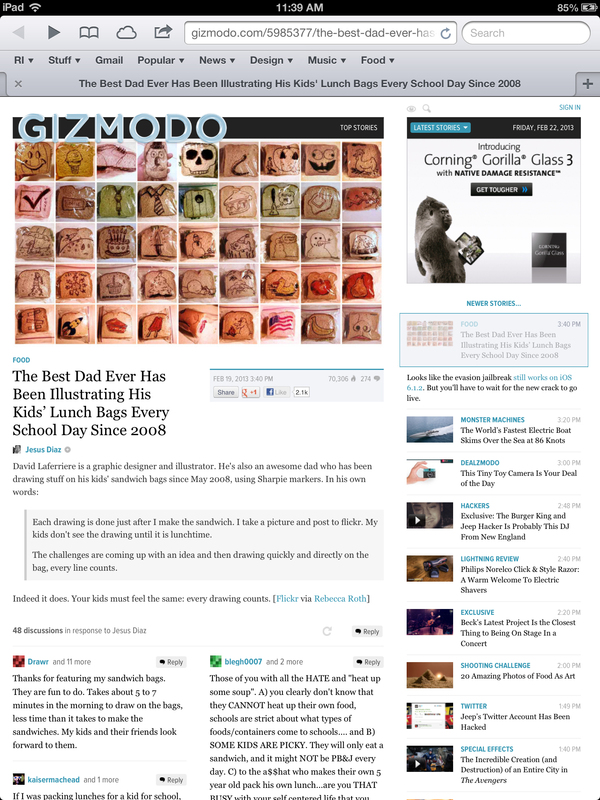 Gizmodo editor Jesus Diaz featured my sandwich bag art on Gizmodo/Food on Feb. 19. It has been amazing how much has come from that one posting. Read the comments, they run the gamut of good, nice, weird, stupid and ugly. Then read the replies to those comments. The comments that struck me the most were those who remember a parent drawing or writing notes to them on or in their lunch bags and those who appreciate the little things we all do for our kids. Immediately my views on Flickr began to skyrocketed. I’ve been putting the sandwich bag art on Flickr since I began drawing on the bags in May of 2008. I had to. They ended up in the trash. At first I would take photos with my point-and-shoot camera and upload a few days or weeks worth. Eventually I got a phone with a camera and began sending them to Flickr on a daily basis. Flickr then to Facebook and on to Tumblr. The funny thing about this is that this week, the week of the Gizmodo posting, is a vacation week for my kids. No school means no lunches which means no sandwich bag art. My boys were in second and fourth grade when I started doing this as a way to jump-start my creativity and have some fun with my kids. I know that eventually I will have to stop doing it. I can only hope that they might do something similar with their kids.